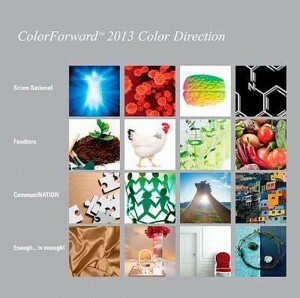 On March 2, Switzerland chemcials company Clariant launched ColorForward 2013, the seventh Annual Color Forecasting Guide for the plastics industry. According to Clariant, ColorForward’s predictions are based on intensive research of the most influential societal trends around the world. Each ColorForward forecast package is based on a year-long effort that involves hundreds of plastics industry and trend analysis experts from around the world. Color specialists from industries as diverse as architecture, textiles, packaging, housewares, automotive and fashion all participate in the process. A final decision was made after a five-day series of deliberation, debate and consensus which took place in Milan, Italy and at Clariant’s ColorWorks facility in Merate, Italy, the company stated. Scien-Sational – The growing sense of optimism that science and technology will find the best solutions to improve the quality of life. Foodture – Food supplies have entered center stage as food has taken on a greater meaning than mere sustenance in our lives. Communication – People are feeling a need to join together with others who share the same interests and values through different social networks. Enough… is Enough! – Accumulating possessions are not the route to happiness. Today’s new generation feels they can enjoy life more by having less. The worldwide Clariant ColorWorks team has developed a range of color palettes that resonate with each trend’s influence. As explained, the color palette for Scien-Sational represents a sense of the mystique and the joy of scientific discovery. Foodture’s palette is very organic and brings to mind a bright, fresh, healthy and tasty salad. Communication offers a warm palette that’s clean, direct and grounded, supportive of the communal outreach. The colors of Enough… is Enough! foster a sense of quality and durability along with the desire for an emotional connection. The color palettes of these trends are quite varied and will give designers much to think about. “But that’s the idea,” said Cristina Carrara, Designer at ColorWorks Europe and a member of the Clariant Masterbatches global ColorForward team. “The colors are conceptual ideas. They are meant to inspire the imagination.” She also points out that the colors can be mixed and matched, and freely adapted to the needs of local markets or blended with regional influences.